Q: Can my wife (husband) go with me? A: No. At the present time, we have our WWII, Korean and terminally ill Veterans on our waiting list and many more who will apply this year. Our mission is to get to every deserving veteran in time. Over 250 World War II veterans have passed away while patiently waiting their turn. Hundreds more will not live long enough to visit their precious memorial. Imagine how long the waiting list would be if we added non-veteran spouses to our waiting list. The only spouses who are permitted to go are those who are veterans themselves. Q: I am the widow of a World War II veteran. Can I go? A: Sadly, the answer is “no”. Adding spouses and widows simply isn’t an option for our program at this time. A: The cost is FREE for World War II, the Korean War, and terminally ill Veteran. You do not need to bring any money unless you intend to purchase souvenirs. Of the disabled veterans going, how many will have to be physically assisted in getting on and off the bus? Which guardian applicants are most qualified? Medically trained, active duty military personnel and veterans who have previously participated in an Honor Flight are given top priority and serve as leadership members. The applicants physically capable of assisting in the lifting of our veterans are also a top priority. Once the Medical and Administrator directors feel enough of those positions to have been filled, other applicants are then considered. Again, these decisions rest solely with the Medical and Administrative Directors. Q: Can I make donations to Honor Flight Austin? A: Honor Flight Austin gratefully accepts donations from anyone EXCEPT our World War II veterans. We feel that World War II veterans have given enough. This is our way of saying “Thank You”! A: Veterans are flown on a “first come, first served basis.” Within the applicants, the top priority is currently given to World War II veterans, then our Korean War Veterans, and ALL Veterans with a terminal illness. Our Vietnam War veterans will be our next priority. A: Our funding comes primarily from individuals across the great state of Texas who recognize the great accomplishments and sacrifices of veterans and want them to see their memorial before it’s too late. Other significant contributors have been fraternal organizations like local American Legion, VFW, Am Vets, DAV, MOPH, posts, and chapters, as well as various corporations. A: WHEELCHAIRS – 100% of the veterans we have transported over the past 2 years are asked to use a wheelchair on their Honor Flight. Our deluxe motor coaches are ordered based upon this fact. Many of our coaches are equipped with wheelchair lifts. OXYGEN – If the veteran requires oxygen, a prescription for the oxygen must be provided by the veteran’s healthcare provider, identifying the delivery method (mask or nasal cannula), frequency (as needed or continuously), and the rate of delivery (2-3 liters per minute). Honor Flight Network will provide an FAA-approved oxygen concentrator for use during the trip if local oxygen equipment is not available. We also provide oxygen cylinders to be used at the memorials. If an overnight stay in the D.C. area is required, we will provide an overnight concentrator for use in the hotel room. Veterans on oxygen are required to have oxygen cylinders available from their home to the departure airport and also on the return from their local airport back to their homes. No oxygen cylinders are permitted to be used on the aircraft. Q: Are terminally ill World War II veterans given any special priority? A: YES! Such veterans go to the top of the list for the next flight departing to Washington D.C. as part of our TLC Program. Not only are World War II veterans given this top priority, but any terminally ill veteran, who has never been able to visit their memorial, is given the same priority under our TLC Program. Please call us for more information. A: Throughout the United States there are several programs that operate in conjunction as part of Honor Flight Network, the national effort to honor our most senior Veterans. This governing body establishes general protocols, policies, credentialing and maintains a national Website and oversight of several programs. 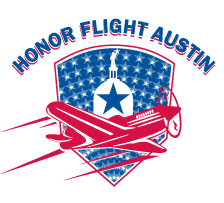 You can also use the contact form, located here, to contact Honor Flight Austin. Q: How do veterans in wheelchairs travel around Washington D.C.
A: The Honor Flight Network is generously supported by the premier motor coach company in Maryland, Dillon’s Bus Service. All of their buses are wheelchair lift equipped.